Verify your marketing lists or verify emails in real-time at the point of capture. Kickbox keeps your customer information accurate while protecting your reputation on SendGrid. 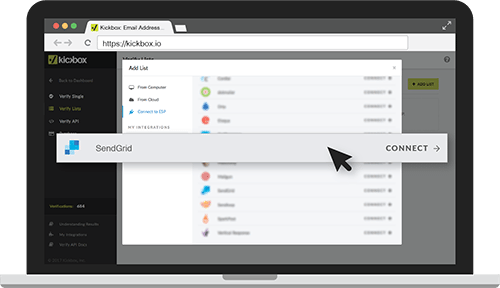 Kickbox provides SendGrid customers with white-hat email verification services. Verify your marketing lists or verify emails in real-time at the point of capture. Prevent bounces from old email addresses. Reduce the number of undeliverables caused by typos and mis-entered information. Make sure your message gets to your customers. Easily verify your existing SendGrid Marketing Campaigns lists directly from Kickbox. Determine which categories of emails you’d like to keep, and send the verified results back to SendGrid. Identify Addresses that are Disposable, Role-Based, Accept-All, and from Free inbox providers. 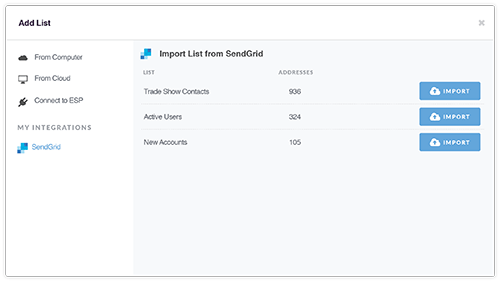 Choose which types of emails to export back to SendGrid. Watch a video or read the docs to learn how to connect your SendGrid account, verify a list, and export the results.